The Partisan Memorial Cemetery is located in Mostar, Bosnia and Herzegovina. The project was finished in 1965, honoring Yugoslav Partisans who were killed during the World War II in Mostar. It's located in the part of the town called Bijeli Brijeg and displays all the features of a complex architectural, aesthetic and landscape design. It is a unique monument in the urban scale of the city of Mostar, and is of particular ambient value. At the initiative of Džemal Bijedić, the Serbian architect Bogdan Bogdanović was put in charge of the design. The Municipal Assembly passed the decision in 1960 and was carried out by Mostar's Parks and Plantations Corporation. Preparation for the cemetery began in October 1960 and work started on 1 December 1960. Ahmet Ribica, a civil engineer, was in charge of drilling and dynamiting works on the hill and constructing the monument. On 25 September 1965, the 20th anniversary of the liberation of Mostar and the formation of the Mostar Battalion, it was opened by Josip Broz Tito. In 1992, the cemetery was badly damaged by war and dynamiting. After the war, the cemetery deteriorated due to severe neglect, vandalism and devastation. On 31 January 2003, a committee composed of Bogdan Bogdanović, Boris Podreka, Amir Pašić, Darko Minarik, Ekrem Krpo, Zdravko Gutić, Tihomir Rozić, Alija Bijavica, Milica Dogan, Florijan Mičković, Milivoj Gagro, Radmilo Andrić, Mumin Isić and Mustafa Selimović was formed in support of renovating the cemetery. By the end of 2004 an operational programme of measures was created. In 2005, works were fixed and various parts of the complex and greenery were reconstructed. On 9 May 2005, the cemetery was formally opened.In 2006, the cemetery was proclaimed a national monument of Bosnia and Herzegovina. Since then however, the cemetery has once again fallen victim to neglect, heavy vandalism and rubbish dumping. Few places in Mostar could better testify the possibility of a common path for both ethnic sides than the Partisan Memorial Cemetery. Although one could immediately think about Stari Most bridge as the most iconic symbol of the city's unity, it is important to clarify that the bridge doesn't connect directly the two mutually hostile communities. The dividing line does not run on the cliff carving Neretva river, but on the Bulevar road, which is a dismal architectural exposition of the latest conflict’s deeds. While bridges have for sure a strong symbology of connection, Bogdan Bogdanović’s work is a large-scale attempt to draw a common Mostar history, a common path which is built upon the sacrifice of the partisan forces who fought together despite the ethnic diversity. Today, however, the bridge that was recently reconstructed and designed as UNESCO World Heritage in 2004 draws all the attention - its location amid old Ottoman mosques translates into masses visiting it and crossing each day, while the other symbol of unity lies in, until recently, a state of disrepair and neglect. One needs to dig deeper to realise how much Mostar divided is, and, in the same way, one must explore it deeper to find the extensive cemetery standing far away in the southern edge of the western, Croat - Catholic part of the city. The Serbian architect and urban planner Bogdan Bogdanović was commissioned to build the cemetery by the city authorities in 1959. The City of Mostar paid the project and the latter was officially opened to the public by President Tito himself six years later, in 1965. The large burial complex was built on the flank of the steep Bijeli Brijeg which was heavily modeled and slightly rotated in order to accommodate the cemetery. The terraced, 5000 square meters large cemetery overlooks the city, but it is still an integral part of it. The experience of approaching the cemetery is a result of a thoughtful and well calculated design. After a quite lengthy stroll through leafy boulevards, the visitors find themselves in front of a door that leads the way to a series of cobblestoned paths which wind through dense greenery. Nowadays it is not possible to foresee the grandeur of the cemetery which awaits the visitor on the upper side of the complex, although this dimension of hiding is something that has come into play only later, as the general state of abandonment has let the greenery overspread and changed the perception of the space. Time and nature, if let uncontrolled, can bring drastic changes in manmade works, and Mostar’s cemetery is a strong manifestation of such processes. The first steps already reveal that this is indeed part of Bogdanović’s opus - the architect mentioned in some interviews how important it is to him the drama of the discovery process. Bogdanović expressed a certain preference towards the sudden unveiling of his architecture. The first impression is crucial and it alters all the following moments. The ascent to the cemetery starts with two mirroring paths, which both in materiality and shape recall the organic walkways that are so typical to Ottoman Mostar. The idea of symmetrical mirroring is soon abandoned as the paths converge into one and ascent the hill in a serpentine which offers different views of the dense greenery, urban environment, and heavily textured stone walls. There are three main different textures covering the walls - two of them with rock blocks of more or less natural shapes and more or less pronounced fugues. The third texture is a vertical set of grooves that cover especially the upper part of the complex. One interesting aspect is the author’s choice to leave such a large dead end space between the two initial paths - the result is a stony pit surrounded by high walls. Is this maybe an effort to communicate that one needs to step on a higher dimension, namely the paths climbing the hill, to reach the place where the dead reside? The high wall that utterly blocks the visitor may recall the fact that our dimension and the afterworld are unavoidably remote. The path, which is alternating cobblestones and green patches, draws the visitor on a last, nearly straight ramp, which progressively unveils the terraces of the cemetery. Bogdanović has a special sensibility when it comes to set the paths leading to a monument. 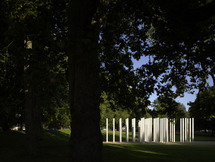 Not only is he well aware of the fact that a good memorial complex is a quality piece of art when it is cleverly positioned in the surrounding environment, but he also understands that architecture must be shaped accordingly; his works are indeed bond to a deep in-situ dimension which makes meaningless any attempt of reproducing the same shape elsewhere. Bogdanović has indeed the sensibility of an urban designer when it comes to project both the monument itself and the paths leading to it - this can be seen in some other Bogdanović’s works as well, as it is the case of Jasenovac, where both paths and the monument itself are crafted with the same care. The partisan cemetery in Mostar is an integral part of the city and can be easily considered as an urban place. It reflects and, at the same time, tries to mitigate the concept of duality which is marking so much the city nowadays. The latter is facing different dualistic, contrasting characteristics - two ethnicities (Bosniak and Croat), two religions (Christian Catholic and Islamic), two parts of the city, two river banks, etc. The cemetery again proposes this very same contrast, but the chosen dualistic concept has deep, ancestral roots which grow well beneath all the aforementioned divisions - it is the contrast between life, the city itself, and death, the necropolis that Bogdanović created with this burial place. No theme could be more universal than the stark opposition between one world and the other. The common fate, death, which awaited all the fallen soldiers of the Partisan army, didn’t distinguish ethnicities. In the very same way the result of their sacrifice, freedom, is a common heritage to be shared and to be built upon. The dualism of this complex isn’t just related to its meaning, but also to its form. As there are no clean symmetries on the upper part, each of the terraces’ edges has its own spatial configuration. On the left, where the path reaches the bottom terrace, the architect developed a narrow corridor with walls and arched portals that recall the city’s traditional urban form. The entire place is permeated by a sense of romanticism; that peculiar feeling that we have while observing a ruin in the middle of nature is present in some way also at this cemetery, especially at the upper area. This may be due to the irregular shape of the walls or simply due to the massive use of stone - this is one of the most important characteristics that makes this cemetery standing out from other memorial complexes of the time. The path then leads through some short stairways to side chambers and upper terraces and it is decorated with peculiar holed horns that strongly resemble traditional fisherman’s houses architectural elements, a Mediterranean element that perfectly fits in the dry and scorching climate of the city which finds itself at the intersection of Mediterranean and Oriental cultures. Such holed horns can be found as well in not-so-far Dubrovnik, where these elements are used as a base for flags. The entire complex has plenty of other elements that recall the Mediterranean, European culture that was part of Yugoslavia - from the aforementioned horns to sundials, bare stone surfaces and abstractly shaped classical lions at the entrance to the complex. Another element of this kind can be found on the bottom terrace - it resembles closely the Minoan sacred horn which traditionally testifies the sacrality of the burial place, an element that Bogdanović employed in some other works, e.g. 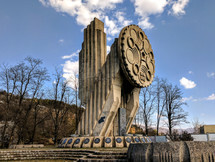 the monument in Štip, Macedonia. Such pagan and yet universal symbology is used also on the right side of the complex. An ensemble of sundials, planets and stars symbolises perhaps the otherworld - of course, traditional religious symbols were in high contrast with the regime guidelines and revolutionary ideas of the time. This universal symbology leads to a “cosmic portal” centrally located on the wall that backs the uppermost terrace. This circular element seems to act as a door between the two worlds and, perhaps, tries to reconcile the different visions that various religions have developed about the afterlife. In front of the portal lies an a-centrically (such positioning is again a Bogdanović signature element) located gear-shaped fountain which used to develop a water stream that flowed down the terraces and emerged again in the deadend space at the bottom of the complex; the underground flow is visually rendered with the vertical grooves motif on the wall between the upper and the bottom part. In the latter, this water motif creates a connection with the cemetery, a connection which is at the same time cut by the abruptness of the dead end high wall. Our dimension and the otherworld are separated, yet the sacrifice of the dead allows life to flow and emerge as part of our intrinsic existence. The narrow artificial water body clearly recalls Neretva river which at lest morphologically splits the city. Duality comes to the surface, again. The complex is not a simple burial place, it is a necropolis, pretty much as the Etruscan cities of the dead found in central Italy. 630 abstractly shaped stone markers testify the multiethnic army that fought together and is buried here - one can find names belonging to Serbs, Croats, Bosniaks, Jews… Many different groups, yet one single destiny - death, which looms over the city of the living in remembrance of the sacrifices offered to gain freedom and peace. Ironically, the memorial which so much aimed at unity was among the hardest damaged structures during the latest war and it still continues to be so today. The contrast between the living ad the dead was soon overshadowed by the conflicts between the living alone - ethnic cleansing and sectarianism led to oblivion and vandalisation of this common cemetery, as the visitor can see while observing numerous Ustaša graffiti on the walls. There is hope however, as the future perpetually brings changes. The cemetery is being restored and cleaned of all the excessive greenery, but a strong both political and grassroots will is the only force that might release this masterpiece from the deadly grip of nationalism. One day, the cemetery may become again the common place of all the living and the ones that died for these lives to be lived. One day, this burial place may be again reverberating of the voices and laughs that once made it a so integral part of this deeply wounded city.